Unsweetened vanilla almond milk — I use this as coffee “creamer”, in smoothies, oatmeal, etc. Chobani plain greek yogurt — for dressings, baking, as a sour cream replacement, etc. Strawberries, blueberries, kiwi — something I’m trying to do each week is fill up a big tupperware with fresh cut fruit so that it’s easily accessible. And it looks pretty! Dole frozen mango — prob my fave fruit. Has to be frozen! Kale/spinach/spring mix — for jar salads, to put in omelettes… I’ll also freeze some kale or spinach for green smoothies. Bananas — I’ve been really into protein pancakes lately so these have become a staple. Also good to add in smoothies or make clean banana nut bread when they’re ripe! Chia/hemp seeds — I’ve been really into nuts & seeds lately. They add a great crunch to salads, oatmeal, smoothies & these are superfoods! 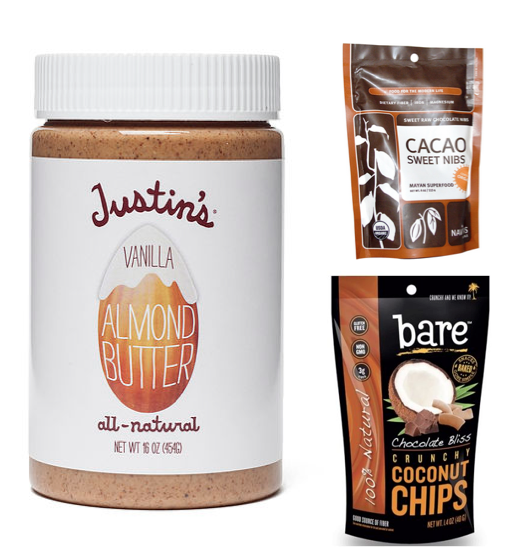 Justin’s vanilla almond butter — new obsession! Quinoa pasta — this is a new thing for me but LOVE it, tastes just like real whole grain pasta!! Avocados — put a little bit of lime juice and sea salt on it and OMG it’s sooo good for an afternoon pick me up; also try sunflower seeds and honey on them! Occasional healthy frozen meals like Amy’s or Kashi pizza & EVOL bowls — I’ve learned now to check the INGREDIENTS rather than the calories! Bare coconut chips when I can find them — sooo good! What’s your fave healthy meal or snack? !